Heat oven to 325°F. In medium bowl, mix crust ingredients; press in bottom and 2 inches up side of ungreased 9-inch springform pan. In large bowl, beat cream cheese with electric mixer on medium speed until smooth and creamy. Gradually beat in 1 1/3 cups sugar until smooth, scraping bowl occasionally. On low speed, beat in eggs, one at a time, just until blended. Add liqueur and orange peel; beat on medium speed 2 minutes, scraping bowl occasionally. Pour filling into crust. Bake 55 to 65 minutes or until almost set. Cool completely, about 2 hours 30 minutes. Refrigerate at least 4 hours or overnight before serving. In food processor or blender, process raspberries with syrup until smooth. If desired, strain to remove seeds. In 1-quart saucepan, mix 3 tablespoons sugar and the cornstarch. Stir in raspberry puree. Cook over medium heat, stirring constantly, until mixture boils and thickens. Cool to room temperature. Carefully remove side of pan; leave cheesecake on pan bottom. Serve cheesecake with sauce. Store in refrigerator. 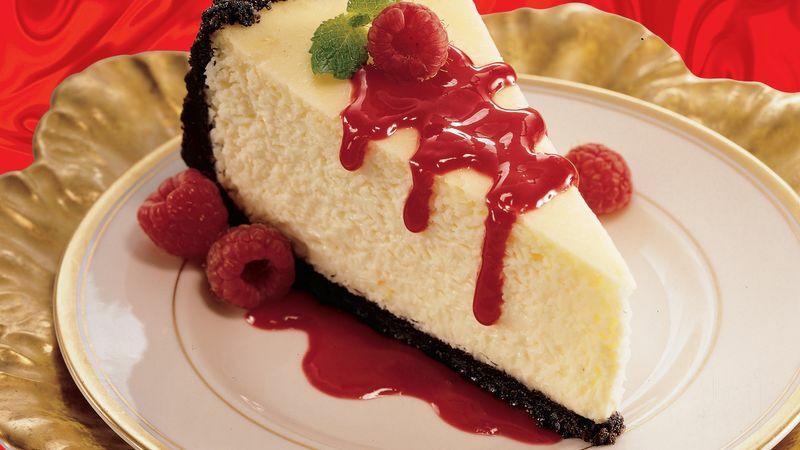 Use a knife dipped in water to make the smoothest cuts in the cheesecake. And for easier cutting, make the cheesecake 24 to 36 hours ahead of serving time and keep it refrigerated.